Is that a tower of diapers? Yes it is! 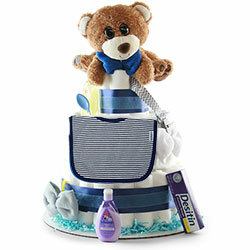 A popular gift for baby showers or nurseries, diaper cakes are a wonderful way to welcome a little one. Assembled in a cake-like shape, these gifts include diapers (of course) as well as a variety of other items that range from rattles and receiving blankets to teddy bears, Wine and Champagne. Diaper cakes are some of the best gifts you can give expectant parents. You can also browse through our Baby Gift Baskets or design your own baby gift with our Custom Baby Gift Basket section for a completely personalized baby gift. Baby diaper cakes are wonderful gifts for showers, not only because they include so many items within one package, but also because they are perfect party decorations. Baby shower centerpieces need to be eye-catching and fun, and these diaper cakes are just what the stork ordered. Tall and colorful, you can’t go wrong with placing one of these on a gift or activity table. Jumping, running, playing – to keep up with a rambunctious little boy, his parents will need to be locked and loaded with all the supplies they can gather. Help the expectant couple prepare for the newest addition to their family by giving them one of our diaper cakes for boys. 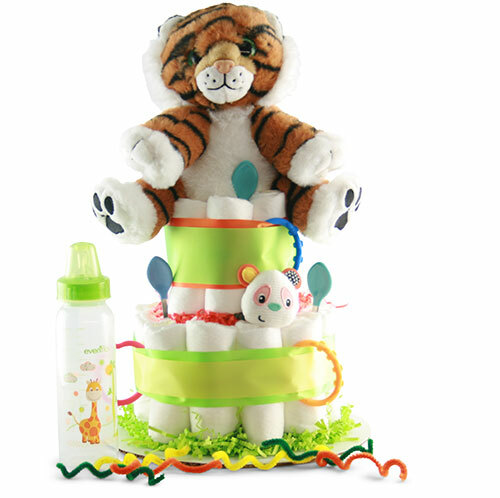 Including both practical items like diapers and baby powder, as well as fun items like toys and stuffed animals, these diaper cakes are the perfect baby gift. Sugar and spice and everything nice? If your friend or family member is expecting a sweet sugar plum, choose one of the diaper cakes for girls. Beautiful yet useful, these presents reflect the excitement of having a child and are full of products that parents will find indispensable. Teething rings, teddy bears, bottles, and more, this little one will have a room full of items to help welcome her to the world, and help her parents with all the practical details of caring for her. How many diapers are included in each diaper cake? The number of diapers included ranges depending on the size of diaper cake you order, but typically you’ll find between 26 and 135 diapers. What size are the diapers? Swaddler diapers (size 1), ideal for newborns, are included in the diaper cakes. If you need a different size diaper, no problem, just ask our design team! Are the cakes made with brand-name diapers? Yes, all the diaper cake options include high-quality, Pamper diapers. How much do diaper cakes cost? 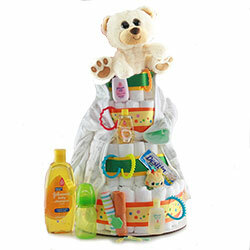 Diaper cakes for sale on our site range in price, depending on the size and level of personalization you choose. How do I order a custom baby diaper cake? If you decide to bypass the standard gift designs and have a few diaper cake ideas you’re interested in, let our Design Experts create a one-of-a-kind, custom baby gift for you! (800) 589-7553. 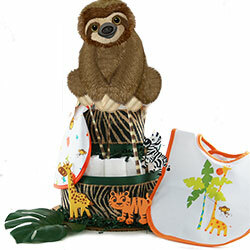 Don’t forget to ask about our stuffed animals, picture frames and mylar balloons. What is a “nappy” cake? A nappy cake and diaper cake are synonymous – nappy is the British version of the word “diaper.” If you’re looking for diaper cakes for a baby shower in the U.S., and see nappy cakes instead, just know that they are the same thing!